Photos from this event are now in the carousel. The story of the Orchestra Symphonique Kimbanguiste and their choir from the Democratic Republic of Congo is miraculous and uplifting. Against the most extraordinary odds, in a country known for its extreme poverty and violence, conductor Armand Diangienda has proved that music can provide hope and inspiration. We are thrilled to welcome them for a concert of orchestral and choral music in collaboration with musicians from London Southbank Centre’s resident and associate orchestras, and from Bristol, members of Bristol Choral Society. 18:45 Young musicians from around the city perform their own composition ‘The Hunt’ in the Foyer, a 30m suite combining Congolese, western classical and popular music. 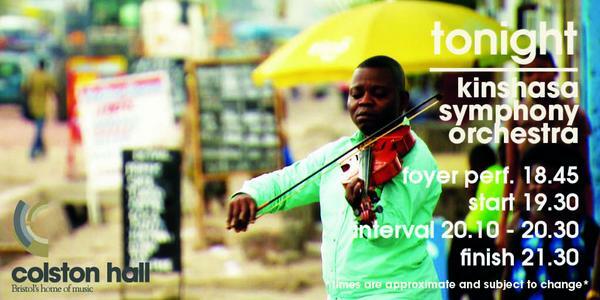 Ticket offer: Watershed will be screening the documentary, Kinshasa Symphony, on Sunday 14 September at 3pm. Show your concert ticket at the Watershed Box Office and receive £1 off your ticket for the screening or bring your cinema ticket to Colston Hall to get £1 off your concert ticket. The Kinshasa Symphony Orchestra (or OSK) is Central Africa’s only symphony orchestra and the world’s first all black symphony orchestra. Established in the mid-1990s by their conductor and musical director Armand Diangienda, theirs is an inspirational story of creating an orchestra from scratch against massive odds, which has survived a war and two coups, and demonstrates the tremendous power of music and the joy it brings to people’s lives. All of the musicians in the OSK are self-taught. Initially there were only 10 or 12 of them and they had to share instruments when they practised. Now the orchestra numbers 60-100 and there is also a 100-strong choir who regularly sing with them. The orchestra and choir perform a wide range of repertoire including Beethoven symphonies and choral works such as Carmina Burana as well as new compositions by some of their members, which have a strong Congolese flavour. Free outdoor concerts in Kinshasa are a feature of their work and help them to attract new members. The OSK players and singers remain amateur musicians combining long working hours with playing in the orchestra. Many players spend several hours travelling on foot to reach rehearsals. Kinshasa is one of the poorest cities in the world and has been ravaged by military conflict. Against this background, the OSK promotes peace and hope through music. Armand Diangienda is the founder, conductor and musical director of the Kinshasa Symphony Orchestra. He is the grandson of Simon Kimbangu, a religious leader greatly revered in the Congo for opposing the Belgian colonists and establishing his own church: the Kimbanguists. 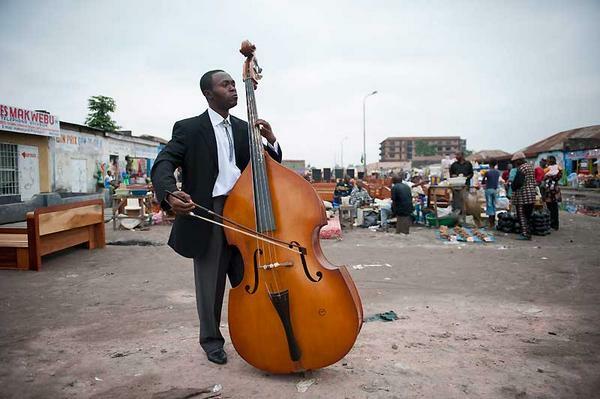 After losing his job as a pilot in the mid-1990s, Diangienda created the orchestra at his father’s church in Kinshasa after which the group is named. The church already had a guitar ensemble, flute orchestra, several choirs and a brass band so he felt a symphony orchestra was a logical next step. Sinfonia Cymru is an exciting and progressive chamber orchestra from Wales. 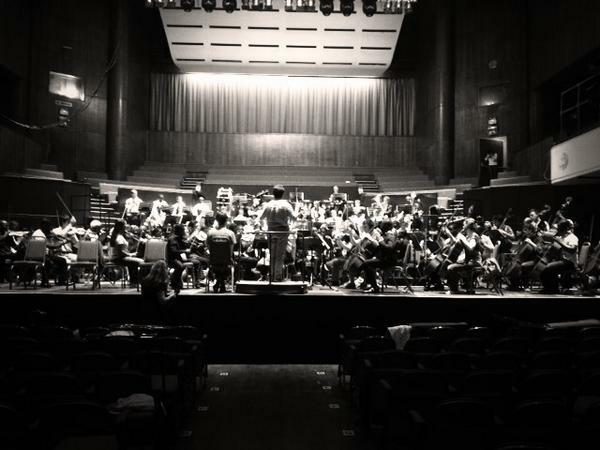 The orchestra is made up of musicians in the early stages of their careers and is the first and only orchestra of its kind to be revenue-funded by the Arts Council of Wales. Collaboration forms a key part of Sinfonia Cymru’s work. In 2013 Sinfonia Cymru worked with Ballet Cymru on TIR & Celtic Concerto (featuring Cerys Matthews and Catrin Finch), an award-winning production of Romeo and Juliet at The Riverfront, as well as with The Clod Ensemble on ‘Anatomie in Four Quarters’ at Wales Millennium Centre and most recently with Bristol Old Vic Director Tom Morris on ‘Towards a Staged Concert’ at the Bristol Proms 2014. The Democratic Republic of Congo has had to deal with an enormous amount of adversity. There have been two civil wars since 1996 and the country is still stricken by conflict. From this difficult position, in one of the poorest cities in the world, rose the only Central African symphony orchestra, and the first all black symphony orchestra in the world. Armand Diangienda founded the Orchestre Symphonique Kinmanguiste (OSK) out of his father’s church in Kinshasa; he had no musical training and founded the orchestra simply out of inquisition. In a short interview conducted during the concert Diangienda said that when the orchestra found out that they were going on their first tour they insisted on collaborating with artists from the country they were to visit, and we can be privileged that it was British musicians who had the honour. Before the concert itself there was a short performance in the foyer, which saw young local musicians collaborate with South African musician Eugene Skeef as well as members of the orchestra. The set, named The Hunt, presented diverse material including classical, rock, urban, and contemporary music. The project, which began a few weeks ago, had obviously been well organised and the children had clearly been supported well. It was a shame, however, to see that despite the support of the leaders, the trio of female singers were still shy on stage: a testament to the change that is needed for the image of performing music in the minds of young people. As the members of the orchestra came onstage, one player in the wind section took a picture of the almost completely full Colston Hall, which made it clear to me that this was an opportunity that all the members of the orchestra truly relished. The first piece was Sibelius’ Finlandia, performed passionately and stirringly as players from Sinfonia Cymru and the National Youth Orchestra of Great Britain joined the OSK. The high standard of the orchestra immediately became evident with such an excellent performance and the audience reflected the orchestra’s enthusiasm with cheers from the first applause of the concert. After a short interview with Diangienda, in which he stressed the orchestra’s passion for collaboration and sharing music, were three pieces of Congolese choral church music. The choir of around forty people performed all of this music from memory. The first piece was simple, with a repeating phrase and a solo soprano, with a call and response type feeling. The second piece was more upbeat, and harmonically reminded me of Elgar’s part songs. The third was lively, with clicking from the beginning, and the solo soprano making hand gestures that seemed to be through personal expression rather than choreography. In the first two pieces most of the members of the choir had their hands together in front of them – not a typical singing stance – that suggested to me the intimacy and honesty of their performance. It felt as if we were watching them worship in church rather than perform onstage. The last piece before the interval was a piece of ‘African classical music’ as Diangienda put it. The principal violinist Héritier Mayimbi and bassoonist Johnny Bayongi composed the piece. The members of the OSK alone performed the first and third movements. The first movement was lilting and dreamy, with a long bassoon solo at the beginning, then taken up by the horn. The third movement was a waltz and much more European, specifically very Viennese in style. I expected this to be the most passionately performed piece of the first half, but I was slightly disappointed to find the orchestra did not perform with as much panache as with Finlandia. However, the composers were received extremely well by the audience, with cheers from many before the interval. As the orchestra came out for the second half a Congolese cellist spoke animatedly with his British desk partner – the two were clearly extremely engaged and excited to be working together. The next piece, final two movements of Berlioz’s Symphonie Fantastique, was performed especially well by the mixed orchestra. The fourth movement featured wonderfully crisp brass and the drama built to a glorious peak at the end of the famous movement. The playful wind parts in the fifth movement were performed extremely well in an energetic performance. The audience once again received the orchestra extremely well and a Congolese and British percussionist shook hands vigorously as soon as the applause began. 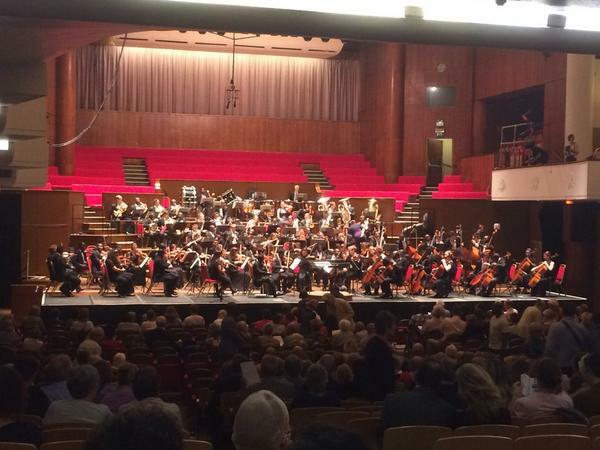 Chief executive of Colston Hall Louise Mitchell, who spoke at various points in the programme, introduced the final piece, the fourth movement of Beethoven’s ninth symphony. She mentioned the obvious appropriateness of the inclusion of a piece concerned with human brotherhood to this concert. The performance was good: the orchestra generally found a good balance with the singers and the quartet brought out key moments in individual voices very well. The players were obviously very passionate and conductor Jamie Phillips had both his feet off the floor on more than one occasion. The audience erupted at the end, the majority leaping to their feet to show their appreciation. I consider this concert to have been a huge success and it is always inspiring to see great music rising out of even the most unlikely of circumstances (just like the Simón Bolívar Orchestra). The standard of playing was very high, and the enthusiasm of the musicians was obvious throughout. It wouldn’t be surprising to see more collaboration and even greater things from the Kinshasa Symphony Orchestra in years to come. The Democratic Republic of Congo remains one of the poorest and most unstable regions in the world. With life expectancy below 50 and the number of people displaced by conflict estimated at 2.6 million by the UN in 2013, the situation has been one of ongoing crisis since the 19th century. That’s why it is so astonishing – and inspiring – that Armand Diangienda founded a symphony orchestra in the capital, Kinshasa, in 1994. ‘The only way I saw to bring people together was to create this unknown thing – a symphony orchestra,’ explained Diangienda when the orchestra performed in Bristol last night. Created from scratch with church musicians who had to teach themselves how to make and play new instruments and often walk many miles to attend rehearsals, the orchestra now has around 100 members and has become a powerful symbol for hope and cooperation against all odds. Now the Kinshasa Symphony Orchestra (OSK) has come to the UK for the very first time.‘A few years ago, I told the musicians that they would start travelling soon, that the world needed to discover this orchestra – and it’s finally becoming a reality,’ writes Diangienda in his programme notes for the four-city tour (the orchestra performed in Manchester, London and Cardiff before coming to Bristol). The reception in Bristol was fantastic. Nearly every seat in Colston Hall’s auditorium was taken and the Kinshasa musicians were greeted with as warm and enthusiastic applause as I have ever heard at an orchestral concert. The evening opened in the cold North, far from the OSK’s origins in the heart of Africa, withSibelius’s Finlandia. The combined forces of Kinshasa Symphony Orchestra, National Youth Orchestra of Great Britain and Sinfonia Cymru (Diangienda wanted to work with British musicians on the tour) filled the hall instantly with a great wall of sound, characterised by metallic brass and beautifully soft strings. Visiting with the orchestra was the Kinshasa Symphony Choir who next performed a selection of Congolese choral music – something Diangienda described as ‘African classical music’ – before the OSK returned to the stage to perform the first and third movements of a symphony written by Héritier Mayimbi and Johnny Balongi. In the first movement, their combination of African roots with the classical tradition somehow created music reminiscent of Shostakovich’s famous Waltz No. 2 from his Suite for Jazz Orchestra. After the interval, the full forces returned to perform the ‘March to the Scaffold’ and ‘Dreams of a Witches’ Sabbath’ from Berlioz’s Symphonie Fantastique, before the centerpiece of the evening, the finale of Beethoven’s Symphony No. 9 – a ‘symbol of hope and joy, from the fall of the Berlin Wall to the streets of Kinshasa’ as Louise Mitchell, chief executive of Bristol Music Trust, put it in her introduction. Seeing the Kinshasa musicians teamed up with the members of the National Youth Orchestra and Sinfonia Cymru, and witnessing the huge combined choral forces (Bristol Choral Societyjoined the Kinshasa Choir) in the famous ‘Ode to Joy’ was incredibly uplifting. As clichéd as it may sound, Henry Wadsworth Longfellow’s description of music as ‘the universal language of mankind’ has never rung so true for me. 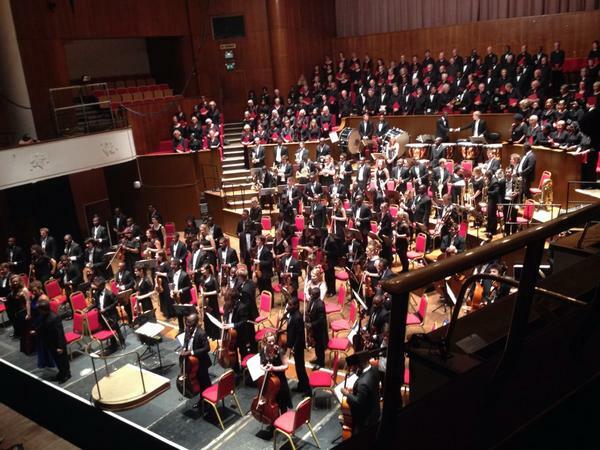 Vivienne Kennedy reviews Kinshasa Symphony Orchestra and Choir at Bristol Colston Hall. On Tuesday 16 September I visited Bristol’s Colston Hall to watch the Kinshasa Symphony Orchestra and Choir perform the last concert of their first ever UK tour, and I consider myself very, very lucky to have seen them. Kinshasa is home to some of the poorest inhabitants on the planet and everyday life there can be a constant struggle for survival. The orchestra has grown from a group of 10 or 12 musicians who had to share instruments when they practised to between 60 and 100 people as well as a 100-strong choir who regularly sing with them. They are mostly self-taught and often play on home-made instruments. They are, quite frankly, awesome. During the Kinshasa Symphony Orchestra and Choir’s visit to the UK they have been working with musicians from some of the UK’s finest professional and youth ensembles, including the Hallé Orchestra and Choir (and their youth counterparts); the Southbank Sinfonia; and the BBC Concert Orchestra as well as the National Youth Orchestra of Great Britain, Sinfonia Cymru and Bristol Choral Society, who all took part in Tuesday’s concert. As well as playing alongside each other in rehearsal and performances in Manchester, London, Cardiff and Bristol, the various orchestras have also offered workshops to the Congolese musicians, ranging from instrument repair sessions to section and individual masterclasses. The concert opened with Finlandia by Sibelius, performed by the Kinshasa Symphony Orchestra, National Youth Orchestra of Great Britain and Sinfonia Cymru, conducted by Jamie Phillips of the Hallé. It was beautiful. Phillips and the musicians then left the stage and we listened to a performance comprising several pieces of Congolese Choral Music by the Kinshasa Choir before Armand Diangienda brought just the Congolese musicians back to perform Mayimbi and Balongi’s Symphony No.1, movements one and three, composed by members of the orchestra. I enjoyed this section very much and was quite sorry when it came to an end and the house lights came on to signal the interval. The first half of the show was fantastic, but the second half was even better. With all the musicians back on stage, it started with Symphonie Fantasique by Berlioz, movements four and five, which are better known as March to the Scaffold and Dreams of a Witches’ Sabbath, and continued with the finale from Beethoven’s Symphony No. 9 in D Minor, Ode to Joy, featuring the massed voices of the Kinshasa Choir and Bristol Choral Society as well as soloists Bryony Williams, Emma Stannard, Matthew Moss and Daniel Shelvey. I don’t have the words to describe how much I enjoyed listening to this music, which makes me a bit of a rubbish reviewer really, but I can say that at times I couldn’t keep myself from grinning and at other moments all I could think was “wow”. It was also a joy to watch, from Jamie Phillips’s enthusiastic conducting to the perfectly in time bows of the string players as they moved across the strings of their instruments. The Kinshasa Orchestra musicians might be self-taught but they certainly matched the skill of the young British musicians they shared the stage with, most of whom, I’m guessing, have been taught by the best teachers and at the finest music schools from an early age. The applause was loud and sustained and the standing ovation richly deserved but there was one last treat, an encore performed by the Congolese musicians and singers alone, their British counterparts obviously enjoying the sound every bit as much as the audience were; then one last round of applause, one more standing ovation, and it was all over, far too soon. I do hope they come back again. The concert was preceded by a foyer performance by some of Bristol’s most talented young musicians who over the course of the last few weeks have created a 30 minute suite of music and song entitled The Hunt, which combines Congolese, western classical and popular music. The group have been working with South African composer and animateur Eugene Skeef, learning about Congolese music and culture, exploring friendship, love, conflict and mythology and the concepts of the hunter and the hunted. Their composition was developed through an exchange of music and ideas with the Kinshasa Orchestra and several of the musicians joined the group on stage. The foyer was packed for their performance and the atmosphere fantastic, putting everyone in the right mood for the night ahead. The Kinshasa Symphony Orchestra and Choir’s tour of the UK was made possible by an Exceptional Award from Arts Council England. Although the Kinshasa Symphony Orchestra and Choir were appearing at the Colston Hall for one night only there is plenty more to keep Bristol’s music lovers happy in the venue’s autumn/winter programme. Fabulous performance by @KinshSymphony et al at @Colston_Hall tonight, inspiring, uplifting stuff and such a well deserved standing ovation. 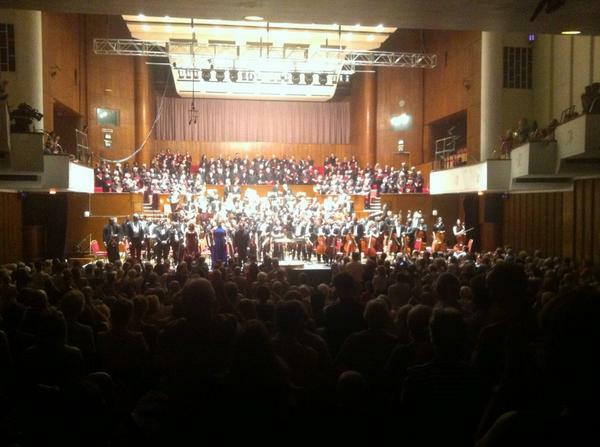 #colston hall Kinshasa symphony orchestra I broadcast you live! 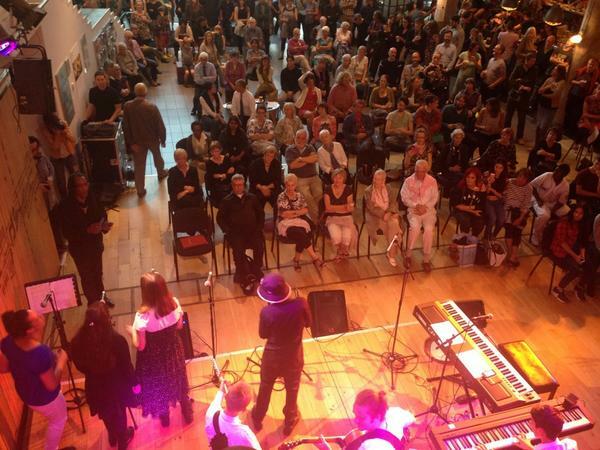 Kinshasa Symphony Orchestra / Shows / Colston Hall #colstonhall #show57842 http://t.co/LHlPGLdzET off to this later on! @Colston_Hall & Lizzie Jane: Thank you for my interview tomorrow with Armand Diangienda of Kinshasa(Kimbanguiste) Symphony Orchestra. RT Hello music lovers, I ve 2 spare tickets for the Kinshasa symphony orchestra playing @Colston_Hall Tue evening @7.30pm Anyone interested? This weeks WhatsOnSW diary page->Bristol: The Kinshasa Symphony Orchestra performs @Colston_Hall on the 16th Sept! Lovely short interview with the Kinshasa Symphony Orchestra from the BBC http://t.co/jlPrRsEkYO Under a week to go! 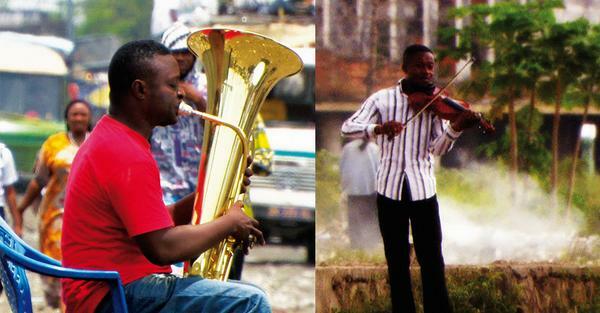 Only a week today until the inspirational Kinshasa Symphony Orchestra perform at #colstonhall. If you have not checked out these guys story, do... Even non-classical music fans can find inspiration in the struggle these guys endure to bring Classical Music to the Congo, one of the worlds poorest countries. They're performing what they've been working on all week, preparing for the @kinshsymphony visit to @Colston_Hall on 16Sep. Come on down! @KinshSymphony Orchestra playing on 16 Sept @Colston_Hall #colstonhall #show57842 http://t.co/YdrKN6ln7a Music like never heard it before! @ceri_shine "@africaexpress: DRC's #KinshasaSymphonyOrchestra perform @Colston_Hall on Sep 16th. Tix + more info: http://t.co/VrQLCw6bYZ"